The number one strategy that every organization who wishes to impact the regulatory process should do is participate in public comment periods. An effective comment is well researched and shows your authority on the subject—what makes your voice worth listening to? Substance is often more valuable than volume, so spend time crafting your best argument and use data to back up your views—whether that is potential cost, number of constituents impacted, or some other quantifiable metric. Consider working with a coalition on a public comment—whether you are part of a trade association and you can activate other members of the association, or you find partner organizations with similar missions, work together to share each organization’s expertise toward a common goal. Read the Unified Agenda to learn about the issue areas federal agencies intend to focus on in a given year. This will help set expectations for your organization on the type and volume of engagement necessary in that year. By making an agency aware that there is a desire for a particular rule, they may choose to open that proposed rule up to public comments. While this is a more complex and lengthy process than commenting to support or alter proposed regulations, it is an avenue of engagement to remain aware of. Different agencies hold public hearings to differing extents, so pay attention to opportunities to speak publicly in favor or opposition to a rule at a hearing. Similar to a public comment, speaking at a public hearing is best utilized when you can offer issue expertise on why a rule should or should not continue as-is. Public hearings are more common at the state level, and with sometimes minimal participation, they can be a good way to make your voice heard if you take the time to participate. Be alerted to new hearings on a given regulations with Quorum. In some cases where a regulation has an especially significant impact on your work, you may be able to have an influence by engaging members of Congress. For example, you could work with the committee or subcommittee that works on the issue being regulated and call on them to hold a hearing about the proposed rule. In some cases Congress does weigh in or review proposed rules, offering an opportunity for organizations to engage with their legislative champions on regulations the organization cares about. Congress must review “major rules”—rules that are especially economically significant, so organizations could engage legislators in the review process. If you anticipate that the regulation impacting your organization is going to be considered by the judiciary, it increases the importance of participating in public comment periods. The judiciary will consider the evidence that the agency had at the time that it finalized the regulation—namely, public comments—so a well-researched comment on the positive or negative implications of the regulation can help move the courts in your direction. Participating in judicial review is also effective if your organization opposes a regulation. Judicial review slows down the implementation of a regulation, and if the officials at the federal or state level change while the regulation is caught up in judicial review, the conversation can change around the issue and change the likelihood of a regulation continuing as-is. The regulatory process is meant to be transparent, with formalized systems for the public to participate. However, if you’re not paying close enough attention, it can be easy to miss critical opportunities for engagement. 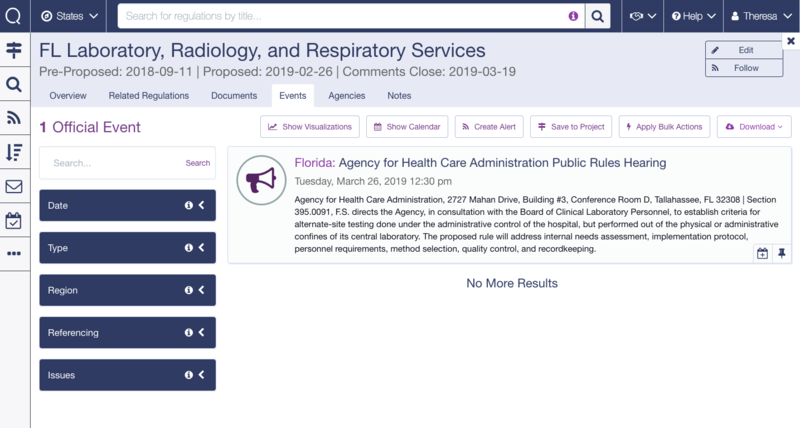 Have an alert system that can warn your organization when a regulation is introduced on your issue when the public comment period begins and ends, and other critical movements of a regulation through the regulatory process. Consider a tool like Quorum that can set alerts for federal and state regulations.